Even before you become a parent, you start forming ideas about how you’ll raise your child. You get advice about it from all sides—your own parents and family, your friends, and books by so-called experts tell you “the rules” of good parenting. But most people soon find out that some of these techniques are simply fads—and many of them don’t work at all. Read on to see what James Lehman thinks are the top five most ineffective parenting concepts out there. The theory today seems to be that if you can make your child feel good about himself, then somehow his behavior is going to change. I can’t tell you how many families I’ve worked with who’ve learned that this is a complete fallacy. Make no mistake, kids don’t feel their way to better behavior. But they can behave their way to better feelings. Self-esteem and self-respect come from doing things that you can esteem and that you can respect. Self-esteem also comes from doing things that are hard for you. Look at it this way: if your child’s school is trying to build your child up by giving him high marks on work that’s mediocre or that’s too easy for him, do you really think your child is fooled? Soon he starts to think he can coast through school—and life. What’s worse, on the inside, he’s thinking, “No one expects much of me. That must mean I really am stupid.” So the intervention for the self-esteem issue—the rewards he’s given to feel better about himself—often have the exact opposite effect. I think rewards have to be based on realistic actions that are performed by your child. If you use a star chart with your younger child, for example, there should be categories on it that are realistic for him—and by that I mean behaviors that are observable and performable. So “Respond to First Requests” is a lot better than “Have a Good Attitude.” Being specific with kids gives them a real chance to perform well. It’s also very important for parents to understand that in order to get kids to develop their self-esteem, what they have to learn how to do is solve problems and function. Consider this scenario: Let’s say one teen studies math and gets an A on his test. Another child doesn’t study and gets an F on the test and then goes to see his counselor that afternoon. When those two kids come home that night, they are not going to be the same. The teenager who’s going to have the self-esteem is the one who studied—who solved the problem of motivating himself to learn the math problems, even though he would have preferred to watch T.V. He’s going to feel like he made an effort and it paid off. But the child who failed the test because he didn’t study won’t feel better in the long run, even though he went to a counselor and talked about his feelings. He may feel better for a time after his session, but if he doesn’t change his behavior and do his homework, he’s going to feel just as bad the next time he fails a test. Talking to a counselor about your feelings may help your mood improve in the short term, but it won’t make you do any better. For that, you have to do the work. If you want kids to have self-esteem, teach them how to solve problems, teach them how to perform. You can start with little tasks and then help them build their way up to bigger ones. Make no mistake about it; self-esteem comes from doing estimable acts; self-respect comes from doing respectable acts. If somebody isn’t performing those acts, they’re never going to have self-esteem. When a child gets angry and acts out, many parents’ first reaction is to ask their child why he’s upset. They reason that if their child understands his feelings, he’ll be able to control his behavior better. In my opinion, this is a misleading belief. Yes, we need to talk with kids about their feelings sometimes, and we need to discuss what makes them angry or upset. But often children—and I’m including younger kids, pre-adolescents and teenagers here—are not good at reflecting about their feelings. So whenever an adult sits down and says, “Well, how did that feel? Why did you do that?” you can see a child shutting down. I think one of the main reasons is because the child really doesn’t know how he feels. He’s upset, he’s angry, he doesn’t like something, or he thinks something isn’t fair. He has thoughts which justify his behavior and feelings. So he says, “I’m angry because it’s not fair. You let Tyler do it and you wouldn’t let me.” He becomes adept at blaming others for his behavior. By the way, if you have a child who can process emotions and talk about them, that’s great. But in my experience, most kids can’t—and especially children who have problems with functioning and behavior. Those kids really need to be taught about their feelings, not asked about them. I think it’s much better to teach kids how they act when they feel a certain way. So instead of saying “Why are you angry, Connor?” you can say, “Let’s look at what you do when you get angry, Connor.” The truth is, understanding why you’re angry doesn’t really help if, as a result of your anger, you are disrespectful, abusive or destructive. Remember, the goal is not for our children to understand why they feel a certain way; the goal is for them to understand how they can behave no matter what they feel—even when they think something’s not fair. It’s very tempting for many parents to go a little easy on the rules—or to try and get the school to bend the rules so their kids with behavioral problems or learning disabilities have fewer problems. Parents see that as a way out. So if Sam is allowed to curse every now and then in class and is not given a detention if he slips up, that’s okay because “Sam has a hard time with that.” And if he’s verbally abusive around the house, there’s more flexibility for him than there will be for his siblings. The problem is that when your child gets older and his special education or therapeutic support ends (in many states that occurs when kids reach the age of 18), he will be in the same starting gate with all the other kids his age. And when that gate opens, he’ll be out there in the race. Make no mistake, if he can’t perform, he’s simply going to fall behind. Don’t get me wrong, I well understand that not everybody is given the same academic proficiency in life. I have a son with learning disabilities and math proved to be a very hard subject for him. But here’s the truth: regardless of academic ability, everybody has to have the same proficiency in following cultural norms and meeting behavioral and performance expectations. So after high school graduation, one kid might go work at Home Depot and one might go to college, but they both have to be able to respond appropriately to authority, speak respectfully to other people, and manage their emotions effectively. They both have to solve the problems that people deal with every day when they interact with others and do it in a way that doesn’t make them strike out or become self-destructive. That’s all there is to it. The problem is that kids with special needs may have different academic expectations, but their social expectations have to remain the same. And if they don’t learn how to behave appropriately now, it will be almost impossible for them later, when they’ve reached adulthood. I know it’s a very hard thing to do, but kids—even those with learning or behavioral problems—need to follow certain standards of behavior. As a parent, you have to learn how to hold your child accountable, even when he’s having a hard time. If you can do this, later on when he’s an adult, he’ll be able to take responsibility for himself instead of blaming everyone else for his problems and looking for an easy way out. Adolescents sometimes experiment with dangerous things. And for some teens, this phase does pass. In my experience, for many, many other adolescents, it does not. Go to any college and look at the amount of substance abuse going on and you’ll see what I mean. One mistake parents make is to rationalize this behavior. So they say, both to themselves and to their child, “Oh, it’s not a big deal—every teenager drinks or experiments with pot at some point.” Realize that if you tell your child, “Every kid does it, and so did I,” you’ve just given him permission to do it, too. The bottom line is that these aren’t just adolescent phases for many kids. These are things they try—but then they get stuck there. Sometimes it’s aggressive behavior—some teens and pre-teens get into feeling powerful and throwing their weight around. But make no bones about it: violent, verbally abusive, destructive adolescents become violent, verbally abusive, destructive adults unless some strong intervention takes place. Violence is not a phase. I believe this behavior is often a response to the tremendous amount of stress or frustration that adolescents experience. You have to understand that these kinds of feelings will just intensify as your teen transitions into adulthood. If your 13-year-old son can’t get along with his kid sister without pushing or hitting her now, or if he can’t get along with you without screaming and yelling and breaking things, what do you think is going to happen under the intense pressures of a marriage or a job? Substance abuse is another example of adolescent behavior that doesn’t go away on its own. People often say that kids “experiment” with drugs. I love the word experiment: I picture a kid with a white coat and a rat in the basement smoking pot. Unless he’s a doctor or a lab tech, he’s not experimenting—he’s using drugs. Alcohol consumption is also very risky for kids. Adults may think of alcohol as a social lubricant, but for kids who are under a tremendous amount of stress or anxiety, drinking or getting high gives them relief—and that’s a very dangerous thing. It becomes seductive, and it’s extremely hard for these kids not to go back for more. Parents need to be clear that smoking pot, drinking and doing drugs are high-risk activities. Not only are they dangerous because they affect your child’s judgment, they also affect his ability to solve problems. It’s very important to ask yourself, “What do I want my child to learn?” If you want him to learn that everybody smokes pot and drinks, then tell him that it’s normal. But I think parents should be saying to their kids, “Drug and alcohol use is out. It’s bad for you.” Make it clear from the beginning. In adolescence, there are certain developmental tasks that kids have to learn, like how to deal with anxiety and frustration. If they use drugs and alcohol to avoid learning these tasks, they will pay a price in adulthood. And that price will be that they will not be equipped to deal with these difficult emotions as adults. I think parents can get stuck in a cycle of trying to “up the ante” when it comes to punishing their kids—in other words, each time their child misbehaves, they feel they need to find a bigger and bigger hammer to deal with it. 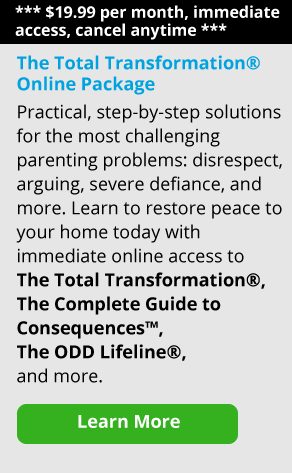 These parents invariably end up getting frustrated because ultimately, this doesn’t work. Soon they start to feel like there’s nothing they can do to get through to their child. My experience is that nobody ever changed from being punished. In our society, we punish all the time, but we have a very high re-offense rate, whether it’s speeding on the highway, drug use, or shoplifting. And we have a very high recidivism rate in our prisons. I’m not saying that people shouldn’t be punished for these crimes—my point is simply that punishment without learning does not result in better behavior. Let me put it another way: punishment that does not include learning how to solve the problem appropriately next time—and then being held accountable for your behavior—is not effective. Let’s say your child was nasty with his sister. You tell him he’s grounded for a month—but now he’s just going to do time; he’ll do his month and then go free. What does he learn when this happens? You hope he’ll learn, “If I do that again, I’m going to be grounded for a month.” But the truth is that when he’s upset, he won’t remember that punishment at all. In fact, most kids (and many adults) cannot recall past punishments with enough power to affect current behavior. Personally, I think consequences should be task-oriented. When your child is given consequences, it should be a learning experience, not a punitive one. I also believe there should be something unpleasant attached to it. For instance, you might decide that your child cannot use the computer until he treats his sister with respect. You can say, “You cannot use your phone until you don’t curse at your sister for 24 hours.” And so the consequences should be task-oriented, not time-oriented—and the time should be connected to the task. You can also build up to longer periods of time. So the first time, he should not curse for 24 hours, then the next time, you can extend it to 48 hours. In other words, you’re getting your child’s self-control to do pushups and get stronger. Although you might even start with one hour, the goal is for him to make it all day without swearing. Remember, teach your child what his responsibilities are, teach him how to meet them and then hold him accountable if he doesn’t. In the end, whether or not your child has behavioral issues or performance problems, your goal is to teach him how to function successfully in life.